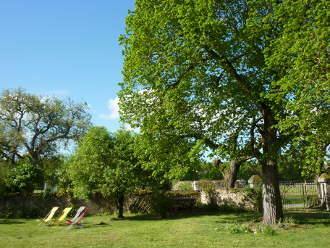 Family suite in B & B in the Loire Valley close to the famous zoo park Beauval. B & B in the heart of "Les Châteaux de la Loire"
This suite has a separate entrance to the garden. Located on the ground floor, it comprises a living area, separate toilet and a bathroom with shower. Bathed in a romantic atmosphere, combining blue and white, it is equipped with a double bed 160 x 200 and two single beds 90 x 190. For hygiene reasons, it is not permitted to "picnic" in the rooms. Rates per night, breakfast included (tourist tax not included).